Mother’s Day is coming up and we heard your mom wants to do something fun with the family. So…on Saturday, May 13th and Sunday, May 14th – this Mother’s Day weekend – we are featuring our popular seafood boil dinner. Take your mom out for a special meal with family at the lodge this Mother’s Day! 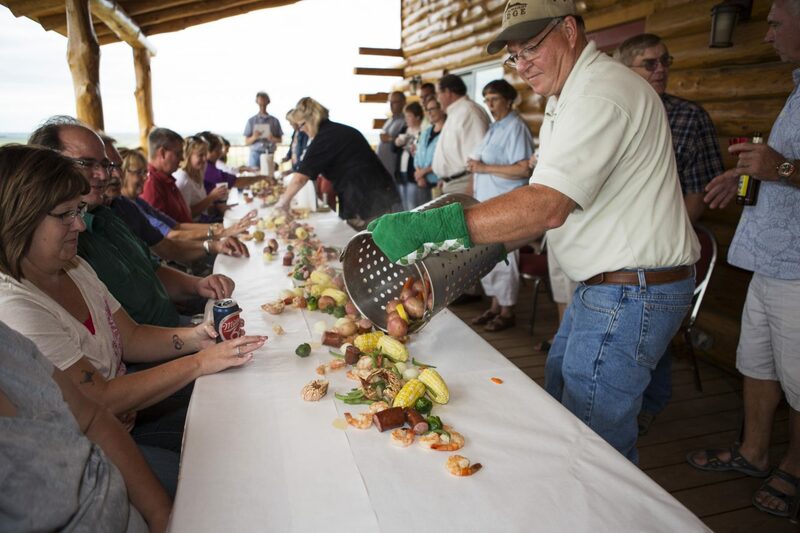 If you have never experienced a seafood boil, you will certainly be delighted by this fun-for-all, group style event. We begin by boiling a selection of fresh vegetables in a large kettle with special seasonings, then we add sausage and seafood. You and your party will be seated with newly acquainted friends at a long table covered with butcher paper and ramekins of melted butter, then our chef will dump out the boil down the middle of the table where everyone will feast on steaming-hot, delicious food. If you see something that looks tasty over by your neighbor, just ask them to throw it your way. We encourage sharing! But don’t worry, you will get all the food you can eat. Everyone is welcome, but space is limited and meals are available by reservation only. The price is $35 per person and includes the meal, a dessert, water and coffee. Sodas and alcoholic beverages will be sold at the bar. There will be multiple seating flights on Saturday evening between 5pm and 8pm and multiple seating flights on Sunday between noon and 3pm. We will assign your meal time when you make your reservations then we will confirm with you. Plan to arrive at the lodge a little early and sign your group in with our hostess. Feel free to roam about and enjoy refreshments from the bar while you wait. We will find you when it is your turn to sit up! ***Special Promotion*** If you are coming out for the Saturday night seafood boil, why not stay the night? We will provide ONE FREE MEAL per room rental for those who would love to have the full lodge experience! Offer valid only for night of event. Rooms are $140 per night.